This is the story of Rosenhouse’s exploration of Creationism. Rosenhouse is an intelligent, rational mathematician and declared atheist (though the way he describes his beliefs I’d put him in the agnostic category myself). He decided in college to explore the seemingly irrational views of ultra-conservative Christians to try to understand how they can possibly deny evolution. This book describes his journey through conferences, museums, and personal conversations. It also has a light smattering of history of the creationist-evolutionist debate. This was a surprisingly considerate and fair book considering the fact that it was coming from an atheist talking about Creationists. 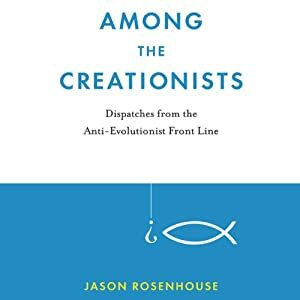 From the beginning, Rosenhouse insisted that although he was well-known as “that atheist guy who goes to Creationist conferences,” he was almost always treated with respect and kindness. This is possibly because his main goal was to educate himself rather than to change anyone’s mind. He did, of course, make public comments/questions to the speakers at the conferences, but they always were polite and seemed to be answered politely as well. Despite this even-handedness, there were a few times that I cringed while reading this book. For instance, he lumped Intelligent Design, Theistic Evolution, Christian Science and and other lesser known ideologies all in with Creationism. He even said that they were pretty much the same thing. They’re really not, though. Denying the possibility of evolution is not the same as saying that God directed evolution. Yes, I can see where an atheist might think the second option wasn’t sensible either. But the basic difference remains – one set denies evolution altogether the other does not. To me, and I would imagine to many atheists as well, an all-out denial of the evidence for evolution is less sensible than saying God directed the evolution. Another lapse in his even-handedness was when he criticized the Creationists as being name-callers – as if that doesn’t go both ways. Trust me, I’ve been disappointed in interviews and essays by prominent evolutionary theorists like Stephen Jay Gould and Richard Dawkins. Scientists can disparage and name-call too. From what I could tell of his book, the conferences were all about getting together with people who totally agree with you to say “Here’s what we agree on, now how can we get others to see the light?” Then they’d have the requisite book signings and other gatherings. So Rosenhouse had plenty of time to hobnob. In his book, he related several interesting conversations between himself and Creationist individuals. Most of these conversations seemed to include teenagers. He’d give information about which authors to read if they wanted to learn more about evolution, or just have an interesting discussion about the points of each argument. I imagine he had a lot of conversations with teenagers because they’re less jaded about trying to convince people of their points of view. The answer is: entropy always increases in a “closed system.” A closed system is one that doesn’t have any exchange of energy with the outside. Like the entire universe. There’s only one universe. There’s nothing that it can exchange energy with. On the other hand, Earth is not a closed system. It’s always losing atmosphere to the space surrounding it. It’s always getting light and heat from the sun. That’s called an open system. Animals are open systems too. We breathe, we eat, we poop. That’s energy exchange. Evolution took place in an open system, therefore the second law of thermodynamics doesn’t apply and there is no contradiction. Ok, maybe that wasn’t easy to explain…Point is, Dawkins could have answered the question politely instead of rudely disregarding it. Although I still think Dawkins was in the wrong, after reading this book I now understand how frustrating it might be to be constantly answering exactly the same question over and over and people ignoring my answer. This is a great post Rachel. The book sounds fascinating. You references several important issues. The issue with Richard Dawkins is a real one. I have read his books, listened to his interviews, watch his Twitter feed, etc. He is a brilliant scientist. I find that I agree some of his observations on religion. However, he is all too often rude, dismissive, insensitive and sometimes petty. It is really a shame. I have spoken with creationists who were amazingly sharp and thoughtful so I can understand that point. As for belief in God and evolution I get that too. If I were a believer my thinking would go something like – God obviously designed a Universe where physical laws apply the vast majority of the time. Evolution is just a consequence of those laws. I haven't yet read a book by Dawkins, but I have The Selfish Gene (which, I know, is one of his much older ones). I am interested in seeing what he has to say since I've heard he's a good writer despite being arrogant.